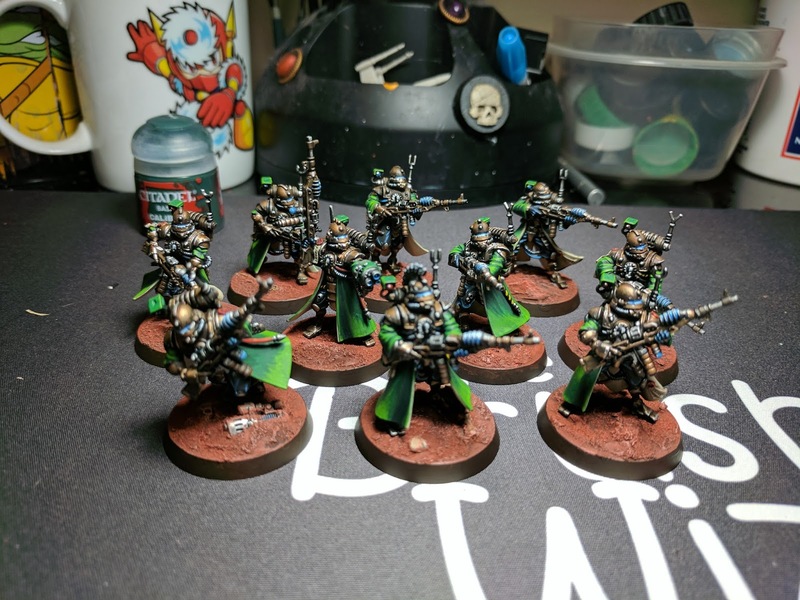 I had assembled all of my Skitarii when I first got them and since I had no idea what I was doing, I just picked weapon load outs that made the teams look cool. This is all well and good, but honestly I wish I hadn't. Seriously, the thought of tossing 31d6 while attacking, while trying to roll as many 6s as possible, was just too much to pass up. 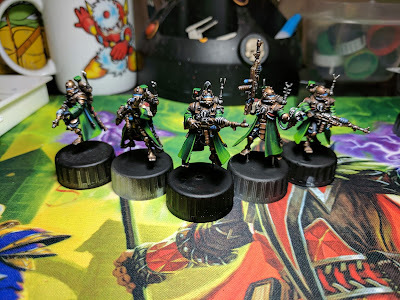 I decided to stick to the Green and Copper color scheme that I had original done on the Rangers I had started painting last year and gave up on, because I make things too hard on myself. This time though I simplified it. Using thin glaze coats on the coats to build up the color, rather than wet blends. Also, I was able to knock out the copper pretty quickly, using my high contrast metallics technique. The models come with 25mm bases, thats a big "no thank you". I managed to scrounge up 10 32mm bases for them. 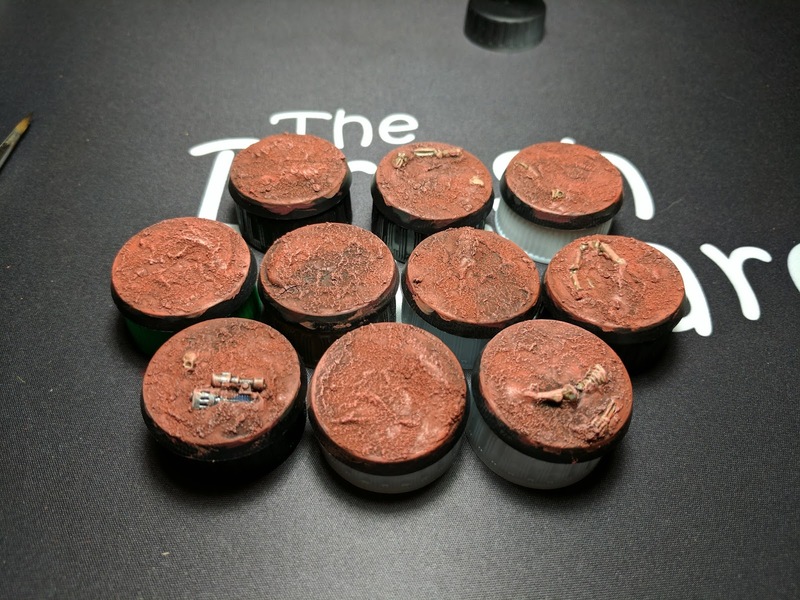 I had originally wanted to do swamp bases, but then decided that I really needed to go with a Mars style base instead, because of the green coats. 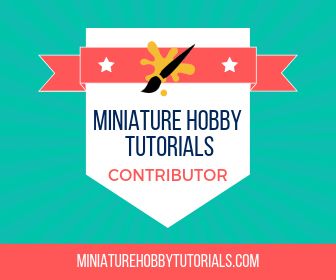 A quick trip to the hobby store later, and I had Mars Ironcrust and Mars Ironearth technical paints to play with. The technical paints work really nice, but even with piling on the Ironcrust paint, it looks really flat. But that was fixed with the help of a bit a green stuff, Reaper skeleton chunks and a plasma pistol. I wasn't too sure on them while I was first working on them. But after the Mars paints were on them, they really popped! Now I'm on a mission for find as many skeletons and random 40k weapons I can to add them to my bases. 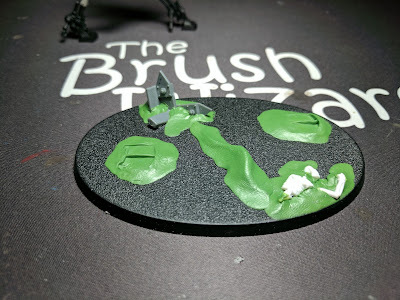 Also, I decided to give Rhinox Hide (the greatest GW paint ever concieved) a try for the rims of the base, instead of my usual go to of Black. That turned out to be an excellent choice, and they look really good with it. The Vanguard look most excellent on their bases too! The Mars bases were definitely the right choice, as the coats really pop now and the models stand out well on them. I had worried that the Mars bases might have been too sparse. But now I don't think that's the case. The bits on them, make them look good as do the mounds of green stuff. With those guys done, it's on to the next piece. 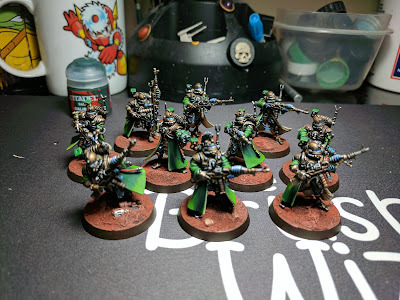 I didn't have another squad of Vanguard and I kinda screwed up my Rangers with a horrible idea about converting them (they are pretty much trash now). Plus, I didn't want to do infantry following infantry, and decided on a Sydorian Dragoon instead. I started on him last night and got a decent amount of progress done. 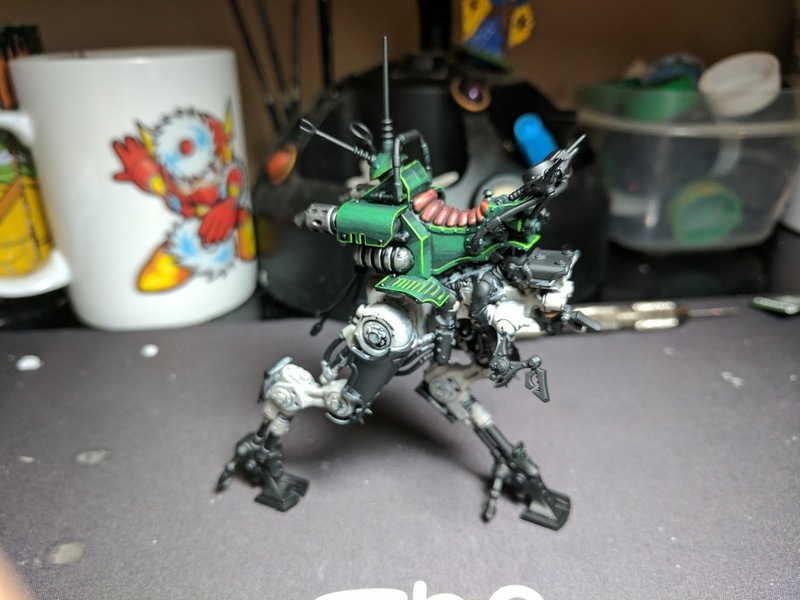 His base is ready for paint and I've started painting the actual walker itself. Unlike the Vanguard, which I should have done this with too. I made sure to put the GS on and then press the model's feet into it, to make it look like the weight of it is sinking into the ground. I also took some old 40 scenery and cut it up, along with the skeleton. Painting him without his base has proven to be slightly annoying though. So tonight, I will finish the base and its feet. Then glue it on and that will give me a hand hold so I don't need to touch the model any more. That's it for now though. Check back later for more progress, or look me up on Twitter and Instagram and see progress as it happens. Oh ya. I had them on 25s originally, but just blue tac'd on. Those bases are too small and I love basing. So it was a no go to use 25s. the bases suit them well !